There was a quiet but long-awaited homecoming in Waipawa last week, with a small group of volunteers, committee members and staff at the CHB Settlers’ Museum taking delivery of several special taonga, on loan from Te Papa Tongarewa in Wellington. Museum chairman Hans Dresel had travelled to Wellington to collect the carefully packed and crated items, which originally came from the Central Hawke’s Bay area. In the past, before CHB had a museum, many taonga from the area were placed in museums further afield to be cared for and exhibited. Refurbishment of the CB Settlers Museum, the large exhibition hall, has made it possible to bring home these taonga and others from the MTG in Napier and around New Zealand, for a new exhibition Nga Taonga o Tamatea Te Hokianga Mai opening on December 1. 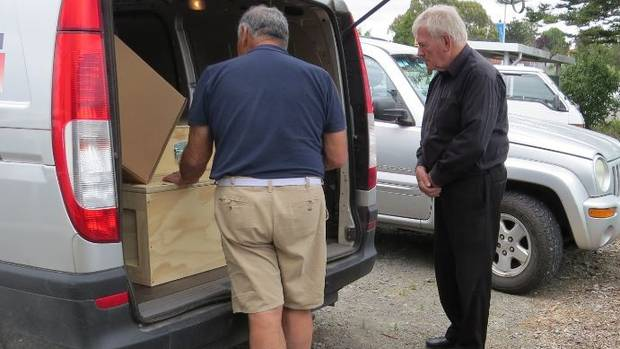 Photo: Donald Tipene, left, blesses the taonga before they are taken into the CHB Settlers’ Museum, after being transported from Te Papa by museum chairman Hans Dresel, right.